We were very fortunate during the holy month of Ramadan, on Friday July 27th and Saturday July 28th 2 2012 to sponsor a very exciting and charitable event to hear the great humanitarian activities sponsored by Niku Charity Foundation. With tremendous generosity and enthusiasm, Mrs. Yassi Nasseri accepted our invitation and attended along with the great Scholar Abdolali Bazargan. Also, of paramount importance was the attendance of a very special guest, Mrs. Masoumeh, an innocent victim of the brutal and anti-humanitarian act of acid attacks. Members of the community from New York, New Jersey, and surrounding areas eagerly responded to our invitation. 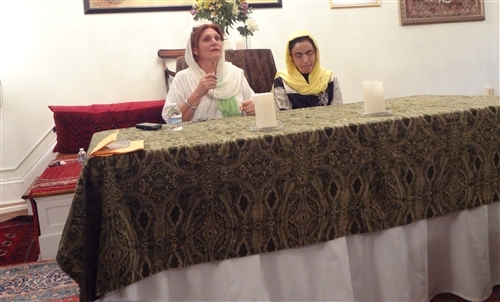 Over 100 people attended each nights’ program and patiently, with great empathy toward Mrs. Masoumeh, listened to Mrs. Yassi’s excellent and emotional presentations followed by a touching talk by Mrs. Masoumeh. As a results of appreciation toward Mrs. Yassi, understanding the situation that Mrs. Masoumeh was in, and expressing deep disapproval of the violent acid attacks, the crowd wholeheartedly supported the compassionate activities of Niku Charity Foundation. Among people attended were famous and loved individuals from our great country Iran, such as the highly esteemed artist Master Farshchian As soon as Mrs. Yassi and Mrs. Masoumeh finished their presentation and talk, all attendees volunteered any kind of help that Niku Charity Foundation may need to grow faster and help those in need. All attendees wholeheartedly supported the charitable goals of Niku Charity Foundation and sincerely appreciated the initiatives that Mrs. Yassi has taken to help those in need. Such support includes financial, professional, hosting victims while awaiting treatment in the US, and any help asked by Niku Charity Foundation. Everyone was tremendously welcoming to our guests, making the two nights unforgettable. It was a great honor to be involved in such a wonderful cause. Through our involvement with Niku Charity Foundation we have been enlightened as to the plight of victims of acid attacks. We hope that this benevolent undertaking will succeed in creating awareness of the horrible act of acid attacks and offering a helping hand to victims of such assaults.